To My Valentine Cupid Graphic. Click the image to view and download the full-size version. What a gorgeous image! Valentine’s Day may be a while away, but this image is eye-catching all through the year. 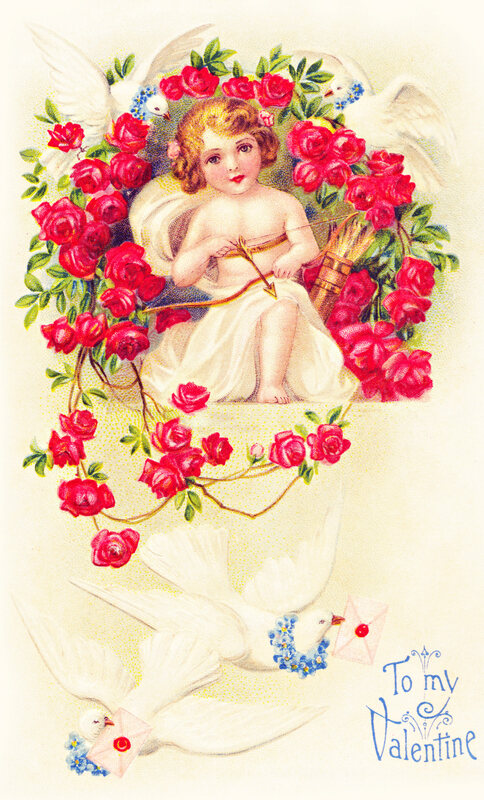 Little can be sweeter than a Victorian cupid, red roses, forget-me-nots, and doves. Actually, the cupid is Edwardian as this vintage image is from 1909. It’s such an adorable illustration that I decided to make a seamless tile from it. Here’s the link: Valentine Cupid Seamless tile. I hope you find a good use for this little angel. Use it for scrapbooking, DIY craft, print transfers or whatever else you dream up. This entry was posted in Valentine's Day and tagged antique image, free graphics, To My Valentine Cupid Graphic, Valentine's Day Graphics, vintage image on November 7, 2014 by ClipArtPlace. Proudly powered by WordPress Theme: Twelve Plus Pro.